Reference: My friend photo for the deadpool pose and wolverine pose from marvel Secret Invasion.. NICE!! I love Deadpool- i'd honestly like him to win- Wolvie's to grumpy... Deadpool's like me!! I'd love to see those two face off! Great work of art. Me too, and thanks dude! This so awesome. Wolverine looks so,well Wolverine-ish. hehehe ternyata ada juga penyuka Komrik boleh tau kalo di indo ada semacem forumnya ato fansclub? No I repainted it, cos I'm still learning how to do paintings, learning lighting and other else... and I took the wolverine pose from the Secret Invasion Cover.. yet i forget what number it is.. it turned out quite good for the wolverine, so I think, why would not add deadpool,and from what I have learned by repainting wolverine, i apply it to the deadpool pose..
oh i see! i was looking at the pic from a mobile, on the computer it looks sooo much better!!! i am seriously loving it!!! wolverine and deadpool's poses look really good! pshh, i know what secret invasion it is and i dont even have to google it! lol. its #7! and i love that cover! urs just looks insanely crazy too!! keep it up man, i love ur work! Hey thanks a lot for the appreciation!! "Logan.. Weapon X just hasn't been the same without ya. Noone calls be BUB anymore... and Omega Reds a bed wetter!!!" 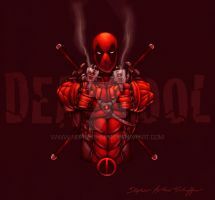 quote:" Logan old buddy it´s me deadpool ... i shoot yooouuu"
both are my favorite super heroes! This looks like an epic battle about to unfold! Great job!